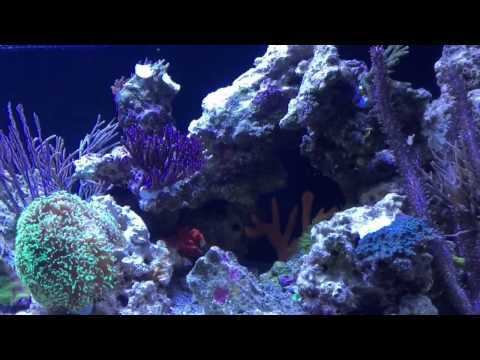 I've been heavy into the saltwater hobby for about 6 years now. Before then, I did what a lot of people do. The decide they want a saltwater tank (I wanted one for yearrrrrs) so they go to their LFS and have the LFS totally set them up. They delivered to my house and setup a 150g tank on black wood stand. We set it up agains the garage wall so the garage could house the return pump and chiller. They set me up with a wet/dry for a sump. I could not afford to add all the live rock at once so I would buy a piece every week or two. That took forever of course. I had a few soft coral but nothing did really well. I tried an anemone once and that died. When i finally pulled it out of the water it sent the worst stench through the entire house that I have ever smelled and could only be described as utter death from the gates of hell. Eventually the tank just proved to be too costly and too much hassle for me at the time so I sold it all off. I wasn't discouraged from the hobby, I just knew I was in over my head. And at the time (early 2000's) I don't think the web presence was there like it is today or at least I wasn't familiar with online forums like I am today, which is a MASSIVE help, as pretty much anyone can attest to. I also got my live rock from other people's tanks that were being torn down. This saved me a bundle and I was able to stock this small tank completely and right away. The bad news is this may have been the cause for future severe algae issues that I fought for 6 months before giving up tearing down the tank. But other than that, the tank did well, coral and fish did well, and I learned a lot about how to properly setup and care of a saltwater reef system. So after about a year or a little more, and having learned quite a bit, I decided it was time to go big again and really build more of a dream system. I found a spot in my house that was currently being used as just a sitting area. I was able to convince my wife that this was just wasted space (I worded it better than that!) and began my planning. My philosophy was changing as I realized that an large aquarium should be designed for the space it's in. The space should dictate the size and style of the aquarium. It is all too common for someone to go out and buy an aquarium and then come home and decide where to put it. I wanted to change that. I decided to do a custom rimless cube build. I had a local tank builder build the tank. I found a local hobbyists who also built furniture build me the stand which I designed myself. This tank was going to be a full walk-around, viewable from all four sides. The house was a modern 60's ranch that had been updated to current modern, clean-lined design and the tank needed to follow this aesthetic. After a lot of research and going back and forth I decided to do a corner overflow and the tank builder came up with this incredible design with a dry dock for Ecotech Vortech pumps. And a pipe for my lighting wires to go down and into the stand below. You can see pics of this setup here on AquaticLog and you will probably recognize it, as it later became the poster child for Ecotech Marine when they introduced their Radion LED lighting. We found a new neighborhood and house plans that had a dining room that backed up to a 3 car garage. This gave me a great spot for the tank, and I could go back to having equipment in the garage? this time a full fledged "fish room". Of course I had to follow my tank design philosophy. The new house was going to be a bit more traditional. As such, this tank build would follow suit in appearance. I decided that the max size this room could handle and still be a functional dining room was about 200 gallons. The tank was purchased/custom ordered through my LFS to my specs with a coast-to-coast overflow and drilled for bean animal fail-safe plumbing. All sumps, frag tank, refugium are located in the garage. The only thing under the tank is the power supplies for my lighting and vortech pumps. I love having this space to work and not having to worry about water spills. After the tank was installed and running, sitting on a support stand build by the tank manufacturer, I had a custom cabinet builder come in and build white cabinetry around the tank, giving it a "built-in" look. I gave him my ideas and we went back and forth a bit before settling on the final design. I am thrilled with how it turned out. My goal all along was to make it look like the room was originally designed to have this aquarium in it and we succeeded. Currently (things are always changing in this hobby!) 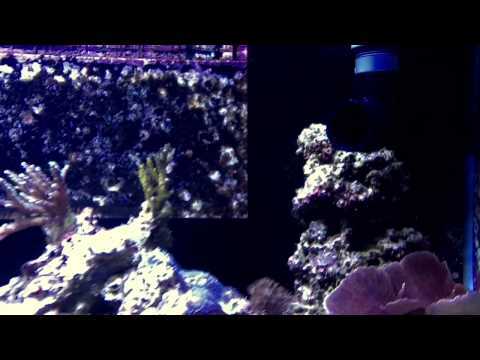 I have a large 150 gallon Rubbermaid sump which houses a lot of live rock and my 30" LifeReef skimmer. I also now have a display refugium with different types of macro algae and a little more live rock. The display tank itself has a large amount of live rock as well. So other than the skimmer, I rely mostly on biological filtration and daily automated water changes. In early January of this year I also removed the GFO from my system as I felt it was stripping the tank of too many nutrients. I do run carbon on and off (more on than off), and I also run some ozone to help break down organics. The display tank currently runs 4 Radion Pros and my lighting schedule can be found in my profile. I have an older generation one Radion over the frag tank and a 200w full spectrum daylight grow lamp over the refugium. I will soon try replacing the grow lamp with the gen 1 radion, and put a newer radion over the frag tank. I have a Reeflo Barracuda Gold and I utilize a BeanAnimal drain system. This provides quite a bit of flow for the tank. Inside the tank I have two Ecotech Vortech MP60's and two MP40's. These are controlled via my GHL Profilux controller and run multiple programs throughout the day. Cup Coral, Turbinaria Turbinaria sp. Flower Pot Coral - Red, ORA Goniopora sp. Jason Fox Hells Eye Mycedium sp. Jason Fox Jack-o-lantern Leptastrea sp. Jason Fox Space Invader Pectinia sp. 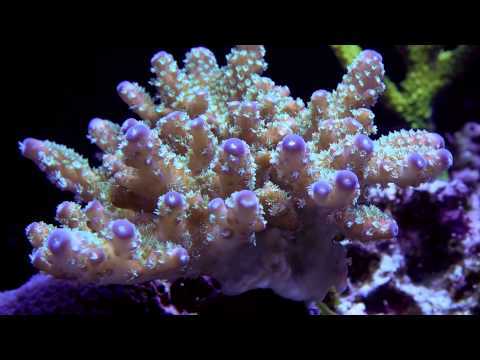 ORA Green Planet Acropora sp. Stylophora Coral - Purple Stylophora spp. Zoanthid - Eagle Eye and Dragon Eye Zoanthus sp. DSA Custom 84" x 24" x 24"
5 Cepex Ball Valves - 1.5"
Currently I dose liquid two-part via a Profilux Doser but will soon be switching to a calcium reactor. Cheaper in the long run and it will also add some minor trace elements not found in two-part mixes. I have also started experimenting with AcroPower from Two Little Fishies. I mainly feed once per day. The bulk of my food is Larry's Reef Frenzy. It's super fresh and clean and provides food for most of the tank in fell swoop. I also try to supplement that with some Oyster Feast and/or Reef Chili for the coral and other filter feeders in the tank. 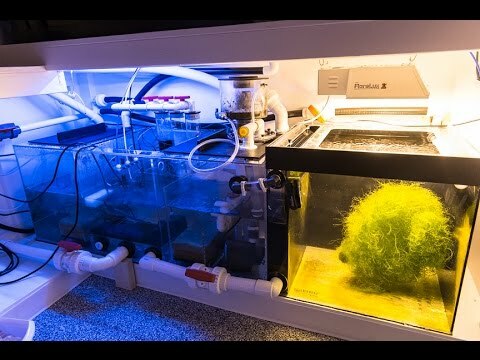 The tangs also get some algae sheets on a magnetic algae clip almost daily, although they do spend a lot of time foresting amongst the live rock in the tank. 1) The skimmer cup gets emptied as needed, usually every few days. 2) The tank gets a ~3 gallon water change twice per day, every day via an Automatic Water Change setup run by my GHL Profilux controller. 3) I clean the glass every few days with an Algae Free magnet cleaner. 46.1% total water change in April. I don't recall exactly. Somewhere between 10-15" i think. You'll have to use the pics to give you a general idea. Yeah, the hose thing is something I'd like to avoid. I like my multi-daily AWC's. Well, the tank is gone, the cabinetry has been converted for the new homeowners, the wall has been patched and painted. 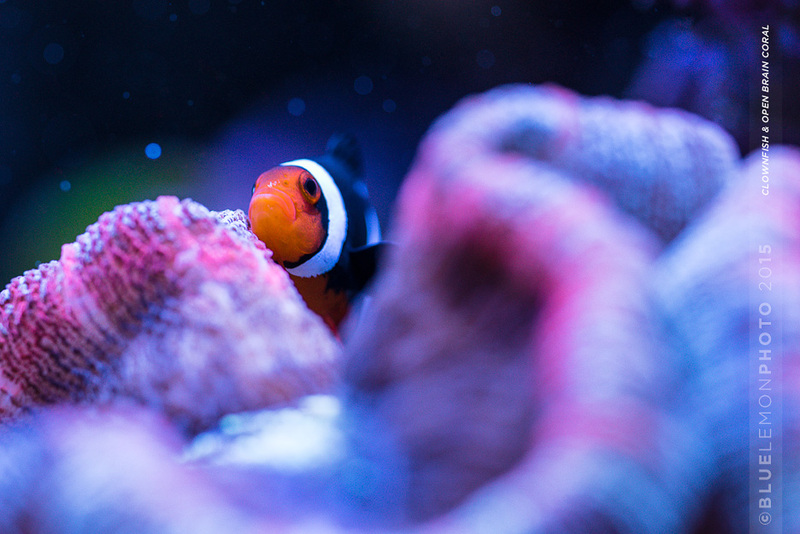 My clown decided to host my open brain since he no longer has an anemone. Ugh. I'm always excited about the next build though. Here's just some of the colonies that I have been selling off. Really all i want is to have a healthy, thriving tank that also looks like it was part of the house. Really try to think things through before proceeding. Do lots and lots of research. Search the internet for build threads and try to learn and mimic from those who have come before you. If you don't succeed the first time, don't get discouraged? most of us have failed. Learn from it and move on.